With Such a Large Inventory, We Can Find You the Perfect Golf Cart! The more, the merrier, we like to say! 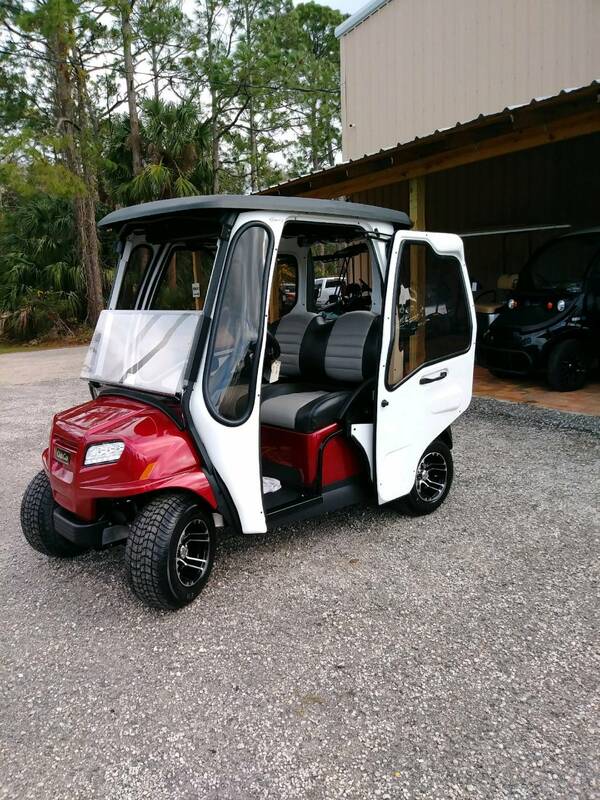 Gulf Atlantic Vehicles, New Smyrna Beach’s premier golf cart provider, carries an enormous array of new and used golf carts; and what our enormous inventory of quality golf carts and accessories means for you is that you can find exactly what you are looking for right here! We also offer hundreds of options and accessories to create the perfect custom vehicle to meet your every need. Gulf Atlantic Vehicles carries all the top brand golf cars in both gas, electric and now Lithium Ion. We offer a terrific variety of models – from one-person compact golf cars, to four-seaters and even eight seaters that can carry passengers or cargo. Our carts also come in a variety of different power levels. So go for the gusto with optimal power or opt for a more eco-friendly cart…whatever your pleasure! Additionally, our new golf carts come with the best manufacturer warranties. Lithium Ion batteries have 5 year warranty!! Gulf Atlantic golf carts accessories range from onboard coolers and sand buckets/bottles, to carpeting/mats, cup holders or custom dash kits, stylish seat covers, sunbrella curtains, GPS units and blue tooth sound systems, LED lights. Some golf cars even come with brush guard, upgraded tires/wheels, and fender flairs. At Gulf Atlantic Vehicles our priority for you is safety, you can choose from a variety of mirrors, rear-view mirror, 5-panel mirror, folding side mirrors, head lights, tail lights, turn signals, seat belts, and tinted and reinforced windshields with wipers for driving in the rain. Opt for roof racks, storage racks or cooling fans. You can get practically anything on a golf cart! Cart yourself on over to Gulf Atlantic Vehicles on Pioneer Trail in New Smyrna Beach at any time to browse through our enormous inventory!